If you're looking for an alternative to the likes of Zoho Writer, Google Docs or ThinkFree online word processors, then Adobe have opened up their Buzzword application to public beta. 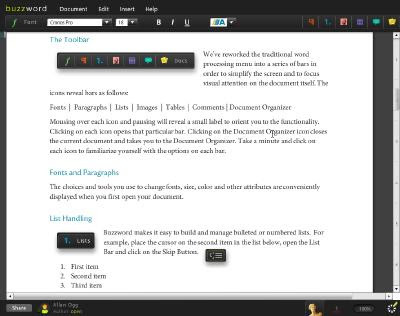 Buzzword is a Flash-based word processor with all the usual functionality of a word processor. On top of that, it has sharing, collaboration and versioning features and you can import and export documents to and from from Microsoft Word (.doc or Word 2003 XML) and Rich Text Format (.rtf) files. As with most beta-level products, there are some issues but it's looking pretty useful and hopefully the developers will get those bugs ironed out and some extra features like embedding links or URLs in there too before long.